I have partnered with Life of Dad and Idahoan® Foods for this campaign, but the opinions expressed are my own. Almost a year ago, my wife and I were lucky enough to buy our dream home in Georgia. We’ve been busy with various home projects and this year, most of our efforts and New Year’s resolutions are focused on kitchen renovations, the food we eat, and how we eat it. With two young children under the age of five, it is often challenging for all of us to go out for fine dining, especially the good steakhouses I love. It’s also a logistical nightmare. To get into the best dining spots, we need to make reservations sometimes weeks in advance, leave work early to make the kids and ourselves presentable, pack a diaper bag since our youngest is only 80% potty trained and the 20% of failures we experience are rather, er, explosive, find a pet sitter for our anxious dog who can’t be left alone for more than 2 hours, and consider traffic and weather so we don’t miss our reservation time. Although the kids may find a roasted vegetable or soup that meets their finicky palate requirements at these establishments, they never leave full. So that leaves my wife and me happily munching away, while my daughters pick at their food, dreaming of eating at home. While they are off in their fantasy world, I am also quietly pondering that there must to be a way to bring this steakhouse experience to our home without sacrificing taste. It seems that I am not alone in these thoughts! A recent survey found that 79% of Americans, including 92% of parents*, wish it were easier to recreate a steakhouse experience at home. As a result, Idahoan wants to help parents and soup lovers alike recreate the steakhouse experience in the comfort of their home with delicious Idahoan® Premium Steakhouse® Potato Soups. That’s why I was inspired to work with Idahoan® Premium Steakhouse® Potato Soups to help me bring a taste of the restaurant experience to our home and to make my home a steakhouse for the evening. For me, I knew I would need to accomplish two things in order to bring the personal steakhouse feel to our home and be the #KingofSoup. The first step would be to make some delicious and hearty soup and the other would be a fantastic place setting! Most importantly, one also has to dress the part, which makes a tie and a collared shirt obligatory, even at home. The Idahoan® Premium Steakhouse® Potato Soup preparation and directions were so easy – by simply adding water, anyone can enjoy the flavorful, slow-cooked taste of restaurant-quality potato soup in the comfort of their home in no time! Although many dry soups take fifteen minutes or more to prepare, this soup can be prepared within 5 minutes. Perfect for those impatient children who suddenly are starving for dinner. It’s one thing to have delicious tasting soup, but research shows that foods tastes better if it is artistically prepared and presented. That’s where a charger plate and a good place setting becomes vital. In short, a charger plate is a large, decorative base setting for which other dinnerware is placed on top of during formal occasions such as catered events, weddings, banquets, or in fine dining restaurants. Charger plates provide an elegant way to serve multiple course meals, where each course is served in its own separate bowl or plate, and placed on top of the charger. Charger plates can catch pieces of food (especially soups), and prevent spills and messes that would otherwise stain the tablecloth or flow onto the table. Chargers also help to retain the heat in dinnerware since they are placed directly underneath plates and bowls. Above is my photo of Idahoan® Premium Steakhouse® Cheddar Broccoli Potato Soup with our gold charger plate. Looks good enough to eat you say? Well that what we did next. As for the taste, it is both kid and parent approved! This hearty soup delivers exceptional taste and texture in every spoonful. Also, it is gluten free. Bonus! Idahoan® Premium Steakhouse® Potato Soups are available in four delicious flavor varieties: Creamy Potato, Loaded Potato, Cheddar Broccoli and Three Cheese Chipotle. 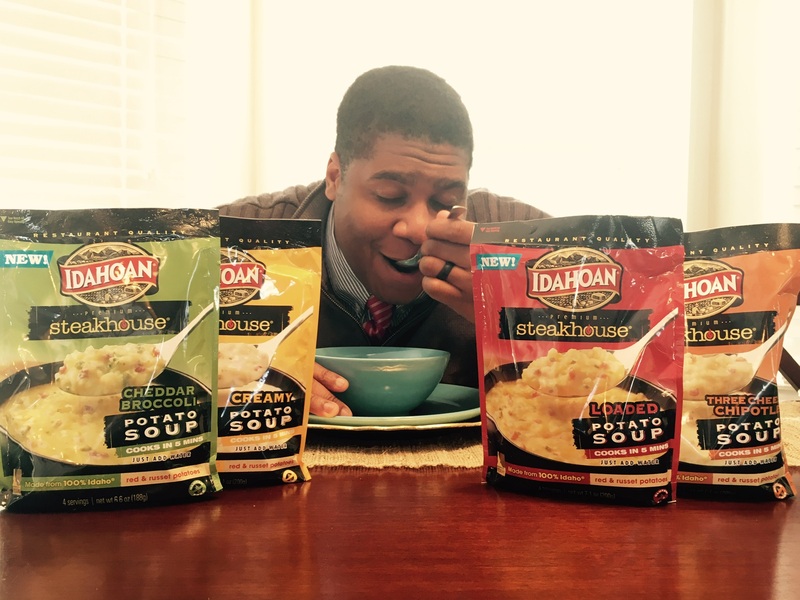 Come try some and be inspired to be a #KingofSoup from the comfort of your own home by following Idoahan® on social media @IdahoanFoods!